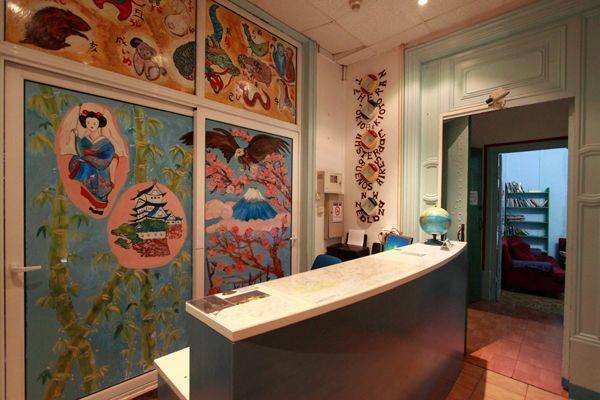 Welcome to Arco Youth Hostel A&A! We offer you free morning breakfast, free internet access, security lockers in the rooms, and towels. All free for you and your friends! With us, you can enjoy Barcelona, in a quiet and safe place. This is a cozy house full of friends! 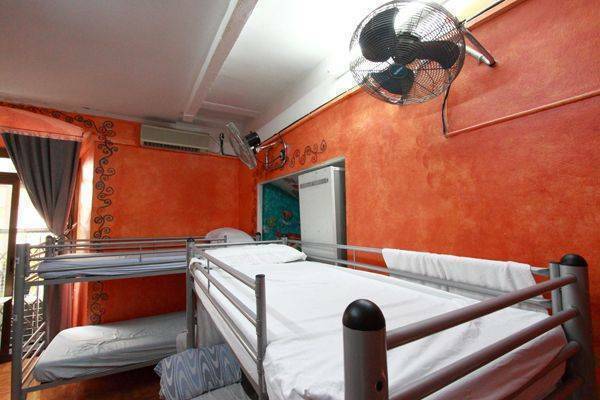 For young people seeking a quiet, clean and friendly environment in the heart of Barcelona. 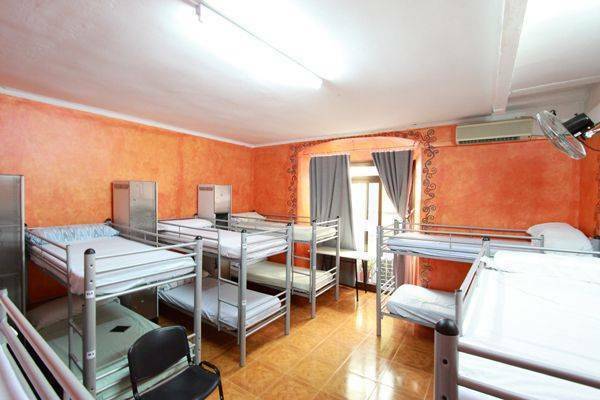 In Arco Youth Hostel you can enjoy the city in a friendly atmosphere, quiet and safe, with young travelers from all the world, who visit Barcelona during all year, in an area with great location. The most central and secure area of this beautiful city, in a quiet street of surprising and fantastic Gothic Quarter. Only a few minutes walking to all directions, without searching for bus or metro. Famous clothing stores, the best shopping area, bars, discos, concerts and venues for the more traditional and sophisticated places of Barcelona. With Internet and Wi-Fi, towel service, breakfast and guest kitchen only in the shared rooms! A&A Arco Youth Hostel. Our young, very friendly and professional staff, always ready to help with all you need, info about the city or amenities in the hostel, just ask! Internet and Wi-Fi in both buildings. 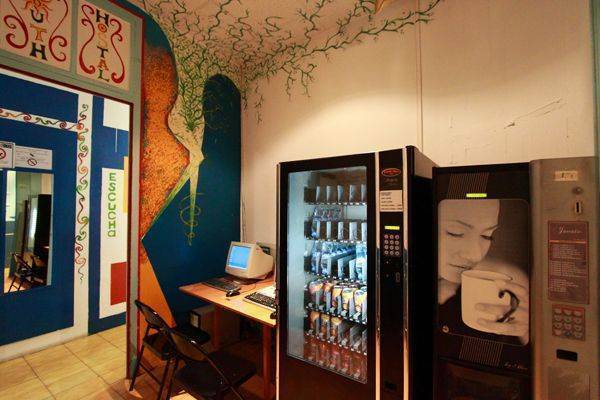 Arco A & A is a youth hostel in the center of Barcelona in a building as historic. Entrance next to the Ramblas and the Gran Teatro del Liceu in Barcelona in Street Boqueria which is the way to the Jewish area (St. Call) built on a rock and when Barcelona was protected by high walls of an enemy days of Rome, near the Town Hall and the Generalitat de Catalunya, a walk from the Picasso museum and Cathedral of city where every street has its peculiar history. Surrounded by all kinds of downtown shops and small made shops and restaurants and bars that give you the best opportunity to discover Barcelona center without wasting time in metro or special bus that stops at night. Just 10 minutes walk to the Port Vell, outputs Ferries sail for the islands of Ibiza, Majorca or Menorca. A few minutes walk from the downtown department stores in the Plaza Catalunya and huge arts of Antonio Gaudi with 5 large construction (Gaudi Palace, Park Guell, Sagrada Familia, Casa Mila, Casa Batllo). Our cancellation policy are 48hrs. before check in date, only by email! • We charge 1 nights in case of No Show or notifying less than 48 hours before check in date. We charge 2 nights on weekends NO SHOW. On bookings more than 3 nights or more than 3 persons we charge 50% of total amount. Please pay attention to this mater to prevent further problems. • The cancelation request must be send to our email 1 week in advance. The group will be charge 50% of total amount if the cancelation email is less than 1 week. • The booking could be canceled if you don’t arrive approximately around the arrival time that is specified in your booking. • In some cases we preserve the rights of charging 1 night of your booking as a guarantee. We ask 3 nights obligatory reservation between 30th of December untill 1th of January. It means we cannot accept bookings less than 3 nights or out of that period. * No show in this period we charge 2 nights. 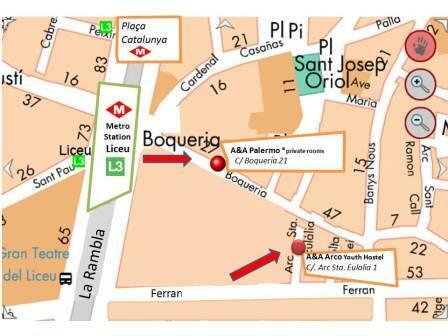 We are located very near to the Liceu metro station on Line III (green line) and Metro station Jaume I (yellow line). Upon exiting the metro, follow 'east on Calle Boqueria 100' feet. Turn right at the arc signal that says 'Youth Hostel' and follow our door. On exit, south-east 'Calle Jaume. After cross Plaça Jaume, (also called Plaza de Sant Miquel) turn right at the fourth street (Arco Santa Eulalia) at Starbucks. Follow this to our door. You can either take the shuttle service in the Aerobus to the airport or the train from the airport. For both, it should stop in Plaça Catalunya. To get to walk from Plaça Catalunya, follow Las Ramblas towards the south until you reach Calle Boqueria. Turn left and walk about 100 meters to the fourth arch on the right. You will see a sign that says 'hostel'. Follow this to our door. It is better, click on the map and have a copy. Thus, it is easy to get to our hostel.